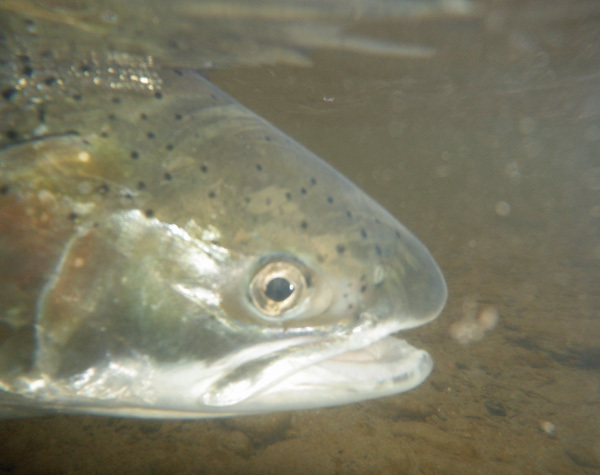 Looking for a Kenai Peninsula Deep Creek steelhead fishing Guide? We can help you out with a guided trip on this beautiful small river. We offer 8 hour full day excursions on light tackle or fly rod for Deep Creek. There are many runs that hold good numbers of fish throughout the fall and this is one of my favorite steelhead streams on the Kenai Peninsula. Fresh fish push in with each tide in the fall and there are days where multiple fish are caught. Add a steelhead trip to your Kenai river rainbow trout fishing trip or just pursue steelhead it’s up to you. There have been falls where I spend over 35 days walking the banks of our local steelhead waters and just the thought of hooking up on one keeps me going back. It is steelhead fishing and these contrary fish can be difficult at times but when it is on it is on! The season is here and if you are interested in a hard fighting fish that will reward you with long runs, cartwheels and jumps before you bring it to hand, this is your trip. Give us a call at 907-382-6808 or email us here on the site!